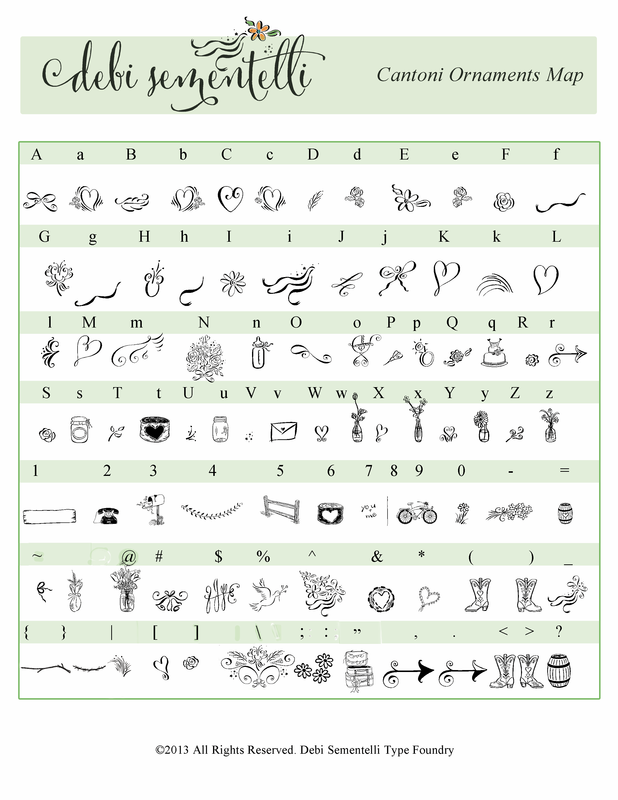 The Cantoni Ornaments font contains a variety of 90 different hand lettered illustrations. Cowboy boots, arrows, mason jars, a bicycle, hearts, a wood banner, and a rotary phone to name a few! They add a fun component to any design, specifically the popular outdoor, rustic event. Peruse the pictures at the bottom of the Cantoni family home page to see examples of the ‘Fonts in Use’. While on the homepage, be sure to also click the READ MORE link for ‘The Story Behind the Font’. Give Cantoni Ornaments a try! Test out a word or phrase by typing in the ‘Sample Text’ box at the bottom of this page. Click on “View Glyphs” in the green box in the upper right to see what’s included in the font or click here. Click here to see the Cantoni Ornaments Keyboard Map showing the entire set. The Cantoni Font Family also contains: Cantoni, Cantoni Bold, Cantoni Pro, Cantoni Pro Bold, Cantoni Flourishes and Cantoni DIY Wedding, which are also available on this site.